Ithala Game Reserve offers a wealth of activities for visitors on a KwaZulu-Natal holiday in South Africa such as ranger guided walks, game drives, swimming and picnics. Ithala Game Reserve in South Africa is a scenic destination for a KwaZulu-Natal holiday in the bush on day and night safaris, guided bush walks, picnics and swimming adventures in the river pools. Conferences and weddings are a special feature of Ithala Game Reserve. Guided trails depart in the early morning and mid to late afternoon depending on the season. Guests at Ithala Game Reserve can also enjoy the independence of self-guided walking trails. This KwaZulu-Natal game reserve in South Africa has a number of routes traversing the wooded mountainside above Ntshondwe Camp. This is a great way to get close to the magnificent flora, fauna and avi-fauna of the reserve. No safari is ever complete without an exciting day of night game drive, the perfect way to discover African wildlife of the bush during a KwaZulu-Natal holiday in Ithala Game Reserve. Game-rives are conducted in state of the art safari vehicles in the presence of an expertly trained ranger and tracker. These can be booked at Ntshondwe camp office. There are quite a few well laid out auto trails at Ithala Game Reserve in South Africa, complete with markers at points of interest. This allows guests the opportunity to experience the African wildlife and fauna of Ithala Game Reserve from the comfort of their own vehicle during a KwaZulu-Natal holiday. 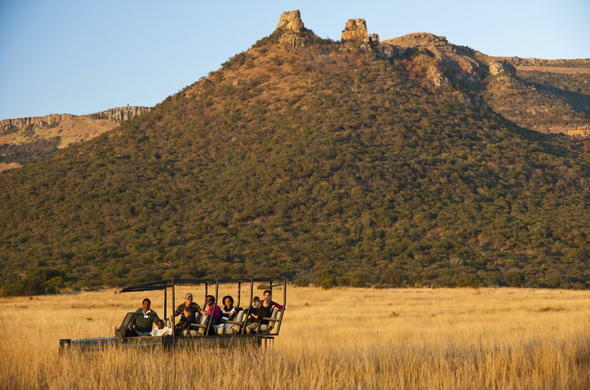 Ithala Game Reserve offers several lovely picnic sites and scenic spots dotted throughout the reserve, each offering a tranquil place to relax and spectacular views. These picnic spots also have barbecue facilities and ablutions. An inspiring and mesmerizing conference in the South African bush is indeed possible at Ithala Game Reserve. The thatched conference centre is air-conditioned, wheelchair friendly and situated in the Ntshondwe Camp. With modern conveniences, facilities and services, this KwaZulu-Natal game reserve in South Africa offers a professional conference centre with a large foyer and veranda, main auditorium and two smaller conference halls or breakaway rooms. The main auditorium is extremely versatile and offers cinema style seating for up to 90 delegates. The two breakaway rooms can seat up to 22 people each. The complex has the latest equipment including a fully equipped projection room housing integrated audio-visual systems (sound system, lapel mike, digital projector and big screen, DVD, video and slide projector, all controlled through an LCD panel). The complex also features fixed and moveable white boards, flip charts and overhead projectors, an efficient photocopy service and access to the internet. Set in 30 000 hectares of spectacular African landscape, Ithala Game Reserve creates the perfect ambience for an unforgettable safari wedding at Ithala. This game reserve offers a wonderfully rare but essential combination of the wild romance of the African bush, with modern conveniences and comforts geared to suit the most discerning guests. For a dream bush wedding, the team at this KwaZulu-Natal game reserve in South Africa will tailor-make a wedding package to suit requirements. Packages could include anything, from a romantic and private wedding to a casual yet intimate ceremony followed by a bush braai (barbeque), or a fabulous extravaganza with game drives, champagne breakfasts and sunset receptions. Additionally, as a special treat, Ithala Game Reserve offers the bridal couple a choice of a secret, romantic hideaway in the Ithala bush or five star accommodation in the lodge, as a honeymoon venue. Visitors to Ntshondwe and to the Bush camps may hire a field ranger for half a day or a full day and go walking in various parts of the reserve to view African wildlife and rock formations. Ithala offers conference facilities in beautiful surroundings. This KwaZulu-Natal game reserve is about 4 hours from Durban and also a wonderful wedding venue.